The VersaTube® Dealer Builder Program allows the retailer, the contractor, the small businessman, the entrepreneur, and the handyman to begin selling VersaTube steel buildings and shelters without the commitment to stocking product inventory. The Dealer Builder program features packaged building kits – complete with the VersaTube framing system, sheet metal roofing, siding and trim from national partner suppliers, and necessary hardware – delivered freight prepaid to the dealer. And for the dealer builder offering installation, the steel frame components have been pre-engineered, pre-cut, smartly packaged and are ready to assemble – unlike a wood frame structure requiring exhaustive on-site measuring and cutting. These complete building packages are loaded with energy, just waiting to be erected. 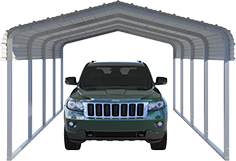 Whether a garage, carport, or loafing shed, this package will be up and completed in no time! 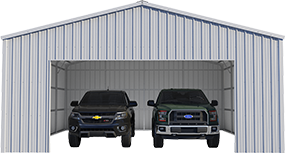 Complete metal building packages delivered freight prepaid to your business location. Market to the DIY customer or generate additional revenue through installation. No franchise fee or inventory commitment is required. Order one unit at a time as your customers place their orders. Easy-to-follow forms (in MS Excel format) put estimating and ordering at your fingertips. Packaged kits include all framing and hardware, plus painted steel roofing, siding, trim and assembly instructions. Concrete work, garage and entry doors, windows or installation are not included, but represent additional revenue opportunities. Available in a variety of sizes and color combinations — including non-standard “Special Requests” for a quote. 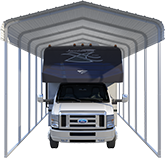 The VersaTube® framing system can be configured to address most local Snow & Wind Load requirements. Materials are packaged as compactly as possible in boxes and on pallets. A forklift or similar unloading capability is required.